Phlebotomy that is part of treatment (therapeutic phlebotomy) is performed to treat polycythemia vera, a condition that causes an elevated red blood cell volume (hematocrit). Phlebotomy is also prescribed for patients with disorders that increase the amount of iron in their blood to dangerous levels, such as hemochromatosis, hepatitis B, and hepatitis C. Patients with pulmonary edema may undergo phlebotomy procedures to decrease their total blood volume. Phlebotomy is also used to remove blood from the body during blood donation and for analysis of the substances contained within it. Patients who are anemic or have a history of cardiovascular disease may not be good candidates for phlebotomy. Phlebotomy, which is also known as venesection, is performed by a nurse or a technician known as a phlebotomist. Blood is usually taken from a vein on the back of the hand or inside of the elbow. Some blood tests, however, may require blood from an artery. The skin over the area is wiped with an antiseptic, and an elastic band is tied around the arm. The band acts as a tourniquet, slowing the blood flow in the arm and making the veins more visible. The patient is asked to make a fist, and the technician feels the veins in order to select an appropriate one. When a vein is selected, the technician inserts a needle into the vein and releases the elastic band. The appropriate amount of blood is drawn and the needle is withdrawn from the vein. The patient's pulse and blood pressure may be monitored during the procedure. For some tests requiring very small amounts of blood for analysis, the technician uses a finger stick. A lance, or small needle, makes a small cut in the surface of the fingertip, and a small amount of blood is collected in a narrow glass tube. The fingertip may be squeezed to get additional blood to surface. The amount of blood drawn depends on the purpose of the phlebotomy. Blood donors usually contribute a unit of blood (500 mL) in a session. The volume of blood needed for laboratory analysis varies widely with the type of test being conducted. Therapeutic phlebotomy removes a larger amount of blood than donation and blood analysis require. Phlebotomy for treatment of hemochromatosis typically involves removing a unit of blood-or 250 mg of iron-once a week. Phlebotomy sessions are required until iron levels return to a consistently normal level, which may take several months to several years. Phlebotomy for polycythemia vera removes enough blood to keep the patient's hematocrit below 45%. The frequency and duration of sessions depends on the patient's individual needs. Patients having their blood drawn for analysis may be asked to discontinue medications or to avoid food (to fast) for a period of time before the blood test. Patients donating blood will be asked for a brief medical history, have their blood pressure taken, and have their hematocrit checked with a finger stick test prior to donation. After blood is drawn and the needle is removed, pressure is placed on the puncture site with a cotton ball to stop bleeding, and a bandage is applied. It is not uncommon for a patient to feel dizzy or nauseated during or after phlebotomy. The patient may be encouraged to rest for a short period once the procedure is completed. Patients are also instructed to drink plenty of fluids and eat regularly over the next 24 hours to replace lost blood volume. Patients who experience swelling of the puncture site or continued bleeding after phlebotomy should get medical help at once. Most patients will have a small bruise or mild soreness at the puncture site for several days. Therapeutic phlebotomy may cause thrombocytosis and chronic iron deficiency (anemia) in some patients. As with any invasive procedure, infection is also a risk. This risk can be minimized by the use of prepackaged sterilized equipment and careful attention to proper technique. Normal results include obtaining the needed amount of blood with the minimum of discomfort to the patient. Wolfe, Yun Lee. "Case of the Ceaseless Fatigue." Prevention Magazine July 1997: 88-94. Finger stick — A technique for collecting a very small amount of blood from the fingertip area. Hemochromatosis — A genetic disorder known as iron overload disease. Untreated hemochromatosis may cause osteoporosis, arthritis, cirrhosis, heart disease, or diabetes. Thrombocytosis — A vascular condition characterized by high blood platelet counts. Tourniquet — Any device that is used to compress a blood vessel to stop bleeding or as part of collecting a blood sample. Phlebotomists usually use an elastic band as a tourniquet. Venesection — Another name for phlebotomy. incision of a vein for the removal or withdrawal of blood; called also venesection and venotomy. arterial blood sample phlebotomy in the nursing interventions classification, a nursing intervention defined as obtaining a blood sample from an uncannulated artery to assess oxygen and carbon dioxide levels and acid-base balance. phlebotomy: blood unit acquisition in the nursing interventions classification, a nursing intervention defined as procuring blood and blood products from donors. phlebotomy: venous blood sample in the nursing interventions classification, a nursing intervention defined as removal of a sample of venous blood from an uncannulated vein. Incision into or needle puncture of a vein for the purpose of drawing blood. /phle·bot·o·my/ (flĕ-bot´ah-me) venotomy; incision of a vein. the incision of a vein for the letting of blood, as in collecting blood from a donor. Phlebotomy is the chief treatment for polycythemia vera and may be performed every 2 to 3 months or more frequently if required. The procedure is sometimes used to decrease the amount of circulating blood and pulmonary engorgement in acute pulmonary edema. At one time phlebotomy was practiced for almost every disorder. Also called venesection. 1. The obtention by venipuncture of blood for a diagnosis. 2. The surgical opening of a vein to withdraw blood–eg, to ↓ blood volume, as in hemochromatosis. See Pharmacologic phlebotomy, Therapeutic phlebotomy. Cf Venipuncture. Incision into a vein for the purpose of drawing blood. Cutting into, or puncture of, a vein, usually for the purpose of removing blood. incision of a vein. See venisection. Phlebotomy Career Training's long years of hard work and perseverance have paid off, proving that quality training need not necessarily have to come from college classes to produce highly qualified graduates in health career fields. A subjective visual analogue scale (VAS) pain score of 0-3 was generated by the researcher and obtained through direct enquiry from each participant immediately after the phlebotomy procedure was completed. 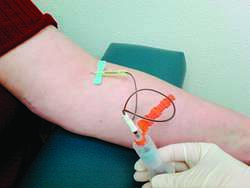 Plasma potassium concentrations are particularly sensitive to variances in phlebotomy technique and thereby provide an opportunity to detect those deviations in technique without direct observation. Factors that influence the selection of phlebotomy devices must be identified in order to ensure optimal cost containment, provision of care, and patient satisfaction. RESULTS: Analysis of variance showed a statistically significant difference in the percentage of specimens rejected for centralized, hybrid, and decentralized phlebotomy configurations [F (2, 28) = 4. In a statement they said: "Practice managers within Flagg Court would like to make patients aware that the withdrawal of the Phlebotomy service was beyond their control. In part, and perhaps most fundamentally, these arguments concern the legitimacy of the technique itself and of the Galenic tradition in which it thrived; they debate specifically whether or not phlebotomy, if practiced correctly, works as Galenists claimed as an effective prophylactic against and as cure for a host of particular conditions. Patients admitted to our own intensive care unit were randomized using a sealed envelope technique to either a highly conservative phlebotomy group, or standardized controls. To the Editor: The mainstay of treatment for patients with clinical haemochromatois is largely phlebotomy and much less attention is paid to the role of dietary iron restriction, although patients are usually advised not to eat too much red meat. The cornerstone of treatment for hereditary hemochromatosis is removal of blood through scheduled blood donations, called phlebotomy.